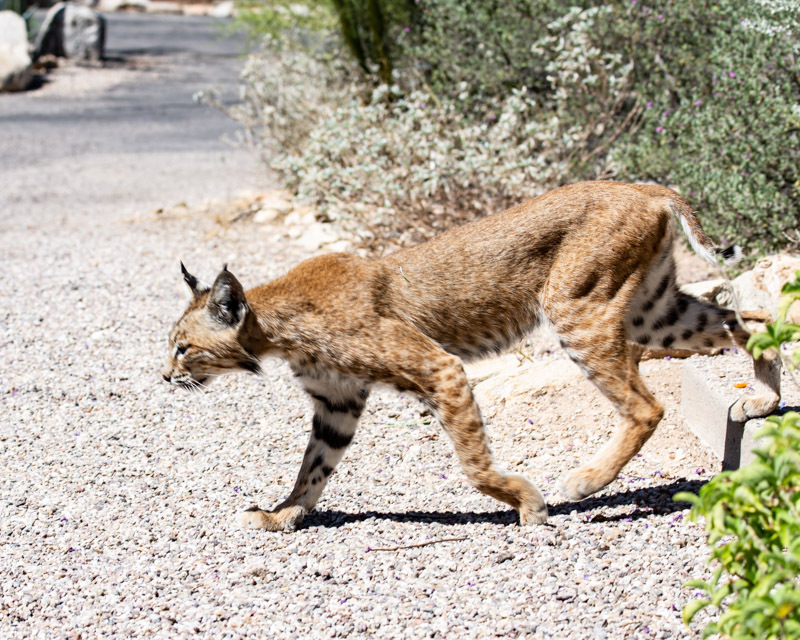 Bobcats roam throughout the Foothills. They have large territories and many resting spots throughout their territories. 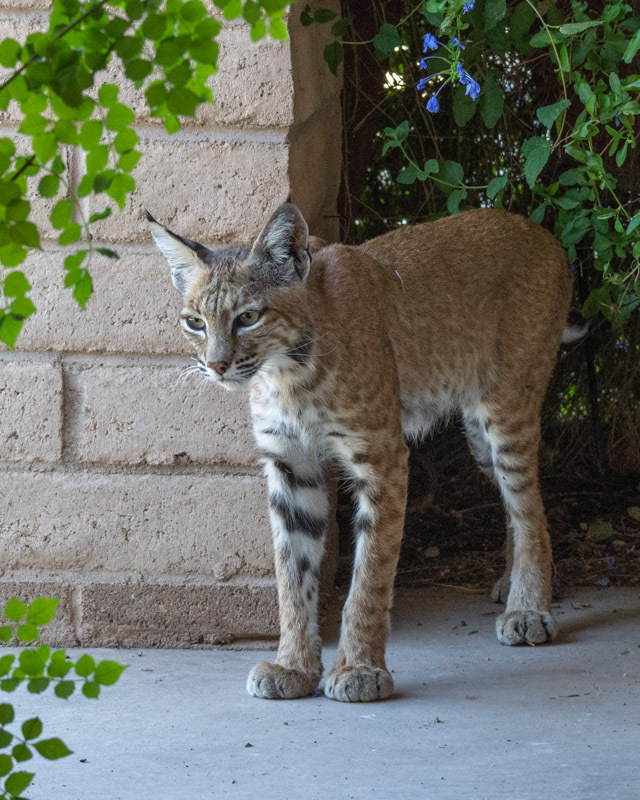 I have discovered that I am fortunate to have a porch that one bobcat has chosen as a safe place to rest during the day. I remembered that previously the Cooper’s Hawk had followed the bobcat and voiced its alarm call and wondered if that was what was happening again. 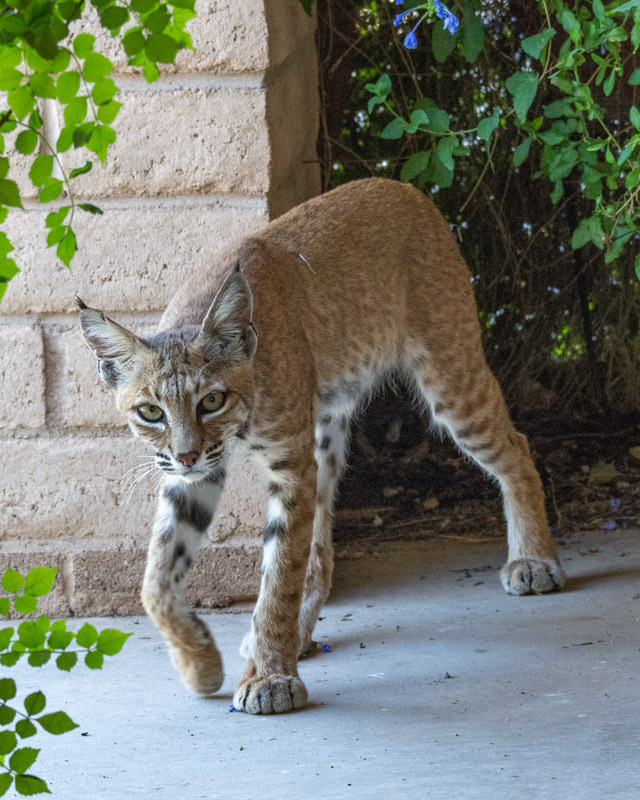 I peeked out the window of my study just in time to see the bobcat walking under the shade of the potted plants on the front porch. I grabbed my camera and quietly walked out of the garage, turning the corner to look. It was very dark under the potted plants so I took a picture without being able to distinguish anything. When I processed the photos, I saw that I got the picture below. 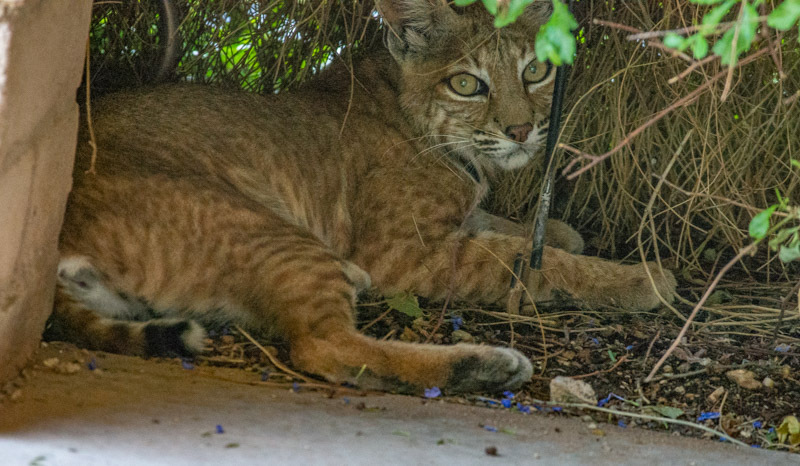 Although the cat’s ears are cut off, it gives you a sense of the bobcat resting in a cool and shady place on a hot Tucson morning. My presence startled the cat and it got up slowly, watching me closely. Other than its oversized paws, it looks very much like a large domestic cat in this photo, with a petite face and seemingly small size. But those paws! 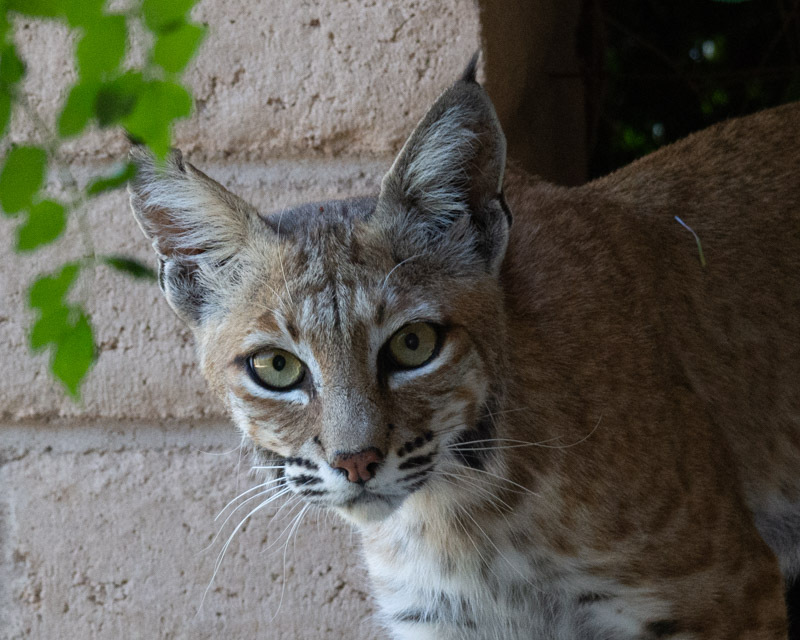 The bobcat’s beautiful face is marked by that pink nose, the black and white stripes, and the ruff of fur around the sides of its face. …then took one final look at me and before turning to the right, walking across the front porch while screened from me by the honeysuckle plants. I was startled by its transition when it reappeared in front of me crossing the driveway. From this new angle and perspective, it seemed to have grown in size. It no longer looked like a cute little kitty- it looked like a long, large, well-developed predator. You can see its physical features well here. Note the pointed ears, the ruff of fur on its cheeks, and the bobbed tail, from which it gets its name. Tails range in length from 2-8 inches long. The tails always are black on the top and white underneath. There are thirteen subspecies of bobcats in the United States, but all have the same general look. 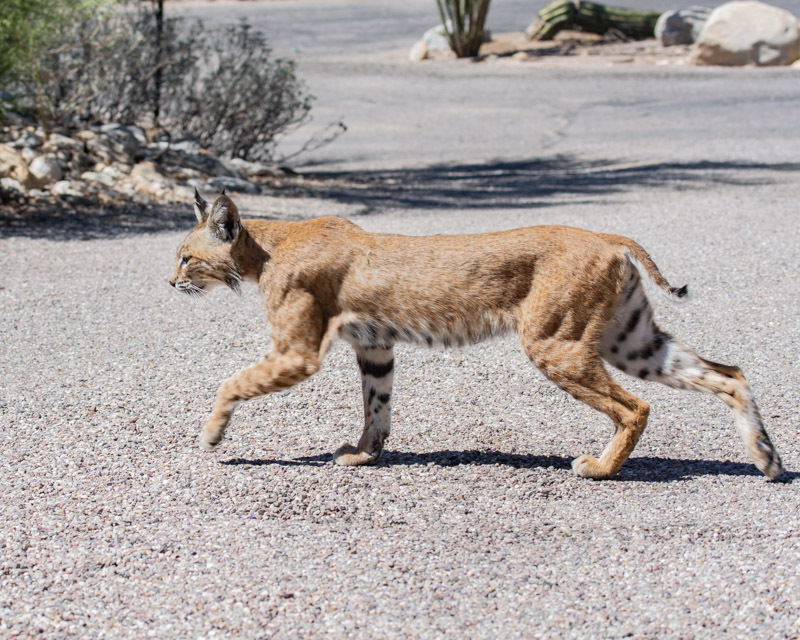 In this shot, the huge, muscular haunches of the bobcat really stand out. This animal pounces on prey and those rear legs are powerful. Even the rear paws look larger than the ones in the front. 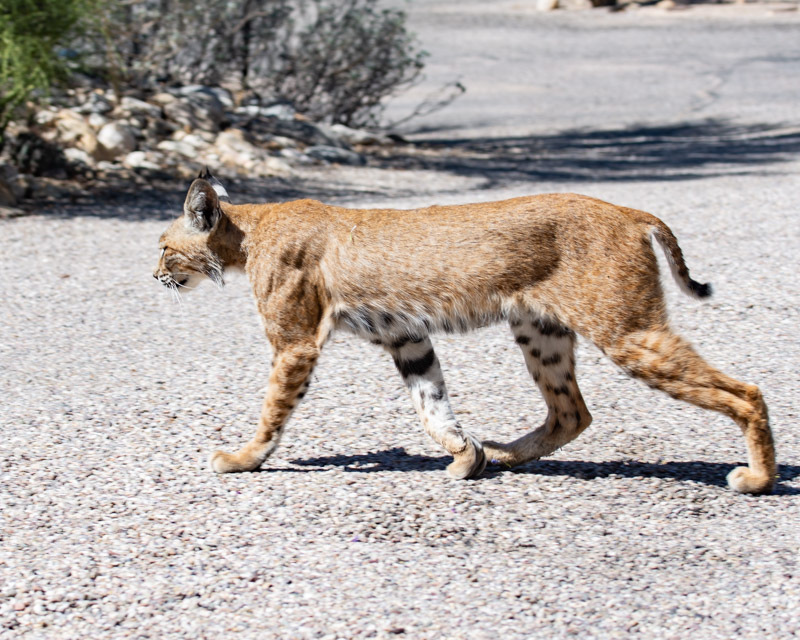 Bobcat’s size ranges from 30-50 inches long and they stand just under two feet high. Their weight varies between 13 and 30 ponds. This is a beautiful and confident animal. Bobcats live individually except for during breeding season. They have large territories with many resting spots and may travel miles each day on their circuit. 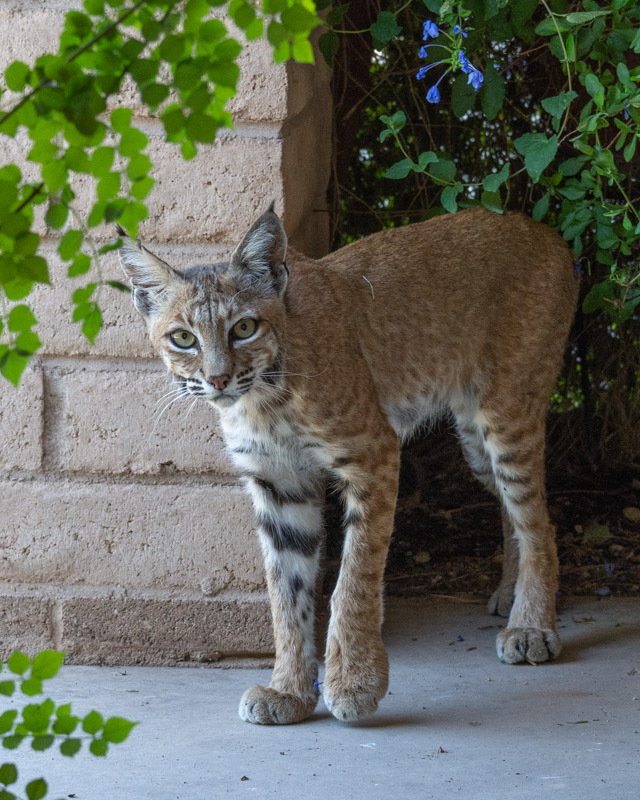 This bobcat walked off looking very self-assured. I’m happy to have discovered that my porch is one of the resting spots in his territory and I hope to see him again soon.